Dental implants are the treatment of choice for missing teeth. It is considered to be the preferred option for those who want to have long-term artificial prosthesis. The successful implant therapy is determined by its ability to fulfill functions such as biting, chewing, cutting, and occlusion. If it is placed in the anterior region of either of the jaws, it should be capable of cutting and, when is inserted in the posterior region, it should have chewing capacity. Bruxism is a condition characterized by grinding and clenching of teeth at night. This is a most commonly occurring parafunctional habit. This is the cause of excessive occlusal load on dental implants due to movement disorder of masticatory apparatus. Excessive overload due to bruxism causes implant and marginal bone loss. This parafunctional habit is considered to be the main failure cause of dental implants and failure rate is decided by the frequency and intensity of forces applied to the dental implants. The direction of forces also determines the survival rate. There is considerable effect on the implant-supported prostheses. There are two thoughts among researchers regarding the effect of bruxism on dental implants. One thought is that the habit itself is sufficient to cause late-term failures, while the second thought of school is that bruxism is a broad term and there are different motor activities and different etiologies behind it. Engel et al. in their study on occlusal wear on bone loss and periotest value of dental implants did not find any bone loss around dental implants. The present study was conducted to assess complications in dental implants in bruxism patients. The present retrospective study was conducted in the department of prosthodontics. The study included 450 patients of both genders. A total of 640 dental implants were inserted in these patients. Ethical clearance was obtained before starting the study. General information such as name, age, gender, site of implant, and bruxism habits was retrieved from the case history pro forma of all patients who received dental implants during the treatment period and followed up for 5 years from June 2010 to June 2016. Among these patients, 124 had bruxism habit. Patients' age ranged between 20 and 50 years and who had implant-supported prostheses were included in the study. Patients with complaints of tooth grinding or tapping sound at night, confirmation of masseter muscle hypertrophy on voluntary contraction during clinical examination, with hypersensitivity of teeth to cold air, clicking sound in temporomandibular joint movements, and presence of masticatory muscle fatigue or stiffness in the morning were considered positively to be labeled as bruxism patients. Patients with a history of drug allergy, history of hypertension, or any other systemic diseases were excluded from the study. Dental radiographs or patients' recalled records were evaluated for the presence of complications such as fracture of implant, fracture of ceramic, screw loosening, screw fracture, and decementation of unit. Results thus obtained were subjected to statistical analysis using Chi-square test. P < 0.05 was considered statistically significant. In this study, there were 240 males and 210 females [Table 1]. The difference was statistically nonsignificant (P = 0.5). The number of dental implants in males was 380 and in females was 260. The difference was statistically nonsignificant (P = 0.1). 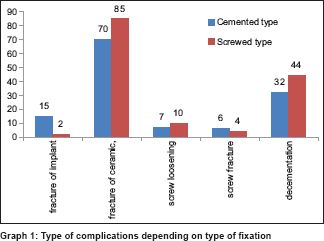 [Table 2] shows that complications were seen in 145 screw-type and 130 cemented-type fixations, while it was absent in 260 screw-type and 242 cemented-type fixations. The difference was statistically nonsignificant (P = 0.5). Prostheses who had complications were single crown (45), partial prostheses (125), and complete prostheses (105), while those that had no complications were single crown (112), partial prostheses (210), and complete prostheses (180). The difference was statistically significant (P = 0.012). [Graph 1] shows that in cemented type of fixation, common complications were fracture of implant (15), fracture of ceramic (70), screw loosening (7), screw fracture (6), and decementation (32), whereas the common complications in screw-type fixation were fracture of implant (2), fracture of ceramic (85), screw loosening (10), screw fracture (4), and decementation (44). The difference was statistically significant (P = 0.01). [Graph 2] shows that the most common complication seen in single crown was decementation (42), in partial prostheses was fracture of ceramic/porcelain (85), and in complete prostheses was fracture of ceramic/porcelain (50). 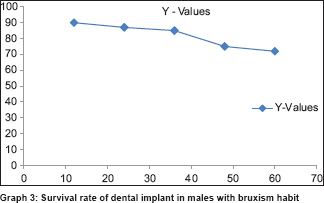 Survival rate of dental implants with bruxism habit in males was 90% after 1 year, 87% after 2 years, 85% after 3 years, 75% after 4 years, and 72% after 5 years [Graph 3]. 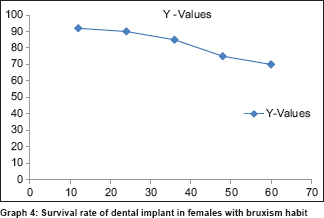 Survival rate of dental implants in females with bruxism habit was 92% after 1 year, 90% after 2 years, 85% after 3 years, 75% after 4 years, and 70% after 5 years [[Graph 4], Kaplan–Meier survivability curve]. The difference among genders was statistically nonsignificant (P = 0.21). Dental implants being preferred and optimal modality for missing teeth are not devoid of complications. The successful dental implant treatment shows normal functioning and esthetics. Bruxism is a commonly occurring motor disorder characterized by night grinding or clenching of teeth. Depending on the severity of the disorder, there can be variable clinical features. Patients often experience pain in temporomandibular disorder area and facial muscles, leading to difficult mouth opening. Occlusal facets are commonly seen in mandibular molars and sensitivity to cold and hot becomes the prominent feature. In a 5-year follow-up study by Fischer et al. on early and delayed loading of implants supporting full-arch prosthesis, 142 dental implants were inserted in edentulous maxillae of 24 patients and 4 implant failures were observed. The role of bruxism as a contributing factor for implant failure was uncertain. Herzberg  in 2006 conducted a study on implant marginal bone loss in maxillary sinus graft cases done on seventy patients with 212 dental implants and found that 15 patients had the habit of bruxism who were prescribed night guards and author did not find a positive correlation between bruxism and dental implant failure. In our study, there were 240 males and 210 females. The number of dental implants in males was 380 and in females was 260. Ibañez  in 2015 conducted a study on 11 males and 30 females, whereas Siebers et al. included 34 males and 42 females with cemented and screw types of fixations. Both types are commonly used. Cement-type fixation is the one where fixed partial denture is luted on abutment which in turn is attached to the implant. It is preferably performed in porcelain-fused-to-metal prostheses in single or multiple crowns. It has the advantages of enhanced esthetics and occlusal harmony. With cement type, the fitting of prostheses becomes perfect. In cemented-type fixations, 130 patients showed complications. In screw-type prostheses, there is direct metal-to-metal connection and hence error cannot be bear. It has been considered the choice of fixation nowadays. A study by Lewis and Klineberg  has found 95.8% success rate of screw-type fixation in dental implants. In our study, maximum (145) complications occurred in screw-type fixation. Suneel et al. in their study of prosthetic complications associated with implant-borne prosthesis in sleep disorder observed complications in 19 cemented- and 12 screw-type fixations. A study by Punjabi et al. evaluated the relation of sleep-disordered breathing and mortality and found that there is a positive correlation between the two. Zupnik et al. conducted a study on 121 clenchers and 220 nonclenchers having 341 dental implants and found no correlation between bruxism and dental implant failure. Nedir  in 2004 conducted a study on 236 patients with 528 dental implants and bruxism habit was observed in 13.6% of patients, with two cases of dental implant failures. van der Zaag et al. conducted a study on 21 sleep bruxism patients. The authors found that occlusal splints become mandatory in patients with bruxism. We found that the common complications were fracture of implant, fracture of ceramic/porcelain, screw loosening, screw fracture, and decementation. It has been observed that overload caused by bruxism may result in failure of implant-supported prostheses. A study by Suneel et al. found 12 cases of fracture of porcelain in bruxism patients (8 – cemented, 4 – screw). In six cases, loosening of screw was observed, 6 cases showed decementation, 4 cases showed fracture of screw, and 3 cases had fracture of implant. In our study, the most common complication was fracture of porcelain (155) followed by decementation (76), loosening of screw and fracture of screw (17) each, and screw fracture (10). Glauser et al. found 41% of dental implant failure in fixature level in bruxism patients and 12% in nonbruxism patients. In the present study, 42.9% of failure was observed. Torcato et al. evaluated the effects of bruxism on dental implants and suggested that there should be specific guidelines regarding dental implant insertion in patients with bruxism. Manfredini et al. did a review of studies and found no specific relation between dental implant rehabilitation and bruxism. Tosun  conducted a retrospective study on 368 patients and found implant and abutment fractures, damage to the occlusal surface, and loosening of gold screws. Manfredini et al. in their review of bruxism as a risk factor for dental implants evaluated 21 articles to assess biological complications such as mobility of implant, marginal bone loss, and mechanical complications such as prefabricated structures and laboratory-fabricated superstructures. The authors found that four studies revealed a positive correlation in mechanical complications among bruxism patients. Mendonça et al. in their case study suggested that parafunctional habits such as bruxism are associated with dental implant failures. Misch  in his study on the effect of bruxism on treatment planning for dental implants suggested that use of metallic bridge, Grade V titanium components, and by using different shape, diameter, length, and thread of screws, the overload over dental implants may be reduced effectively. Thymi et al. from a prospective cohort study evaluated the peri-implant complication with bruxism habit after receiving implant and observed correlation with bruxism habit with complications. De Angelis et al. evaluated the implant survival rate with several risk factors including bruxism habit for follow-up of 10–18 years and they observed 91.96% survival rate. Bruxism is a parafunctional habit found to be related with complications in dental implants. Excessive occlusal overload caused in bruxism patients is the leading cause of failure such as fracture of implant, loosening of screw, fracture of screw, and fracture of porcelain. There is need to inculcate new treatment modality in patients with bruxism. However, large-scale studies are required to evaluate the results. Papaspyridakos P, Mokti M, Chen CJ, Benic GI, Gallucci GO, Chronopoulos V. Implant and prosthodontic survival rates with implant fixed complete dental prostheses in the edentulous mandible after at least 5 years: A systematic review. Clin Implant Dent Relat Res 2014;16:705-17. Albrektsson T, Donos N; Working Group 1. Implant survival and complications. The third EAO consensus conference 2012. Clin Oral Implants Res 2012;23 Suppl 6:63-5. Manfredini D, Poggio CE, Lobbezoo F. Is bruxism a risk factor for dental implants? A systematic review of the literature. Clin Implant Dent Relat Res 2014;16:460-9. Paesani DA, Lobbezoo F, Gelos C, Guarda-Nardini L, Ahlberg J, Manfredini D. Correlation between self-reported and clinically based diagnoses of bruxism in temporomandibular disorders patients. J Oral Rehabil 2013;40:803-9. Engel E, Gomez-Roman G, Axmann-Krcmar D. Effect of occlusal wear on bone loss and periotest value of dental implants. International Journal of Prosthodontics 2001;14:444-50. Mangano F, Macchi A, Caprioglio A, Sammons RL, Piattelli A, Mangano C. Survival and complication rates of fixed restorations supported by locking-taper implants: A prospective study with 1 to 10 years of follow-up. J Prosthodont 2014;23:434-44. Fischer K, Stenberg T, Hedin M, Sennerby L. Five-year results from a randomized, controlled trial on early and delayed loading of implants supporting full-arch prosthesis in the edentulous maxilla. Clin Oral Implants Res 2008;19:433-41. Herzberg R, Dolev E, Schwartz-Arad D. Implant marginal bone loss in maxillary sinus grafts. Int J Oral Maxillofac Implants 2006;21:103-10. Ibañez JC, Tahhan MJ, Zamar JA, Menendez AB, Juaneda AM, Zamar NJ, et al. Immediate occlusal loading of double acid-etched surface titanium implants in 41 consecutive full-arch cases in the mandible and maxilla: 6- to 74-month results. J Periodontol 2005;76:1972-81. Siebers D, Gehrke P, Schliephake H. Delayed function of dental implants: A 1- to 7-year follow-up study of 222 implants. Int J Oral Maxillofac Implants 2010;25:1195-202. Lewis MB, Klineberg I. Prosthodontic considerations designed to optimize outcomes for single-tooth implants. A review of the literature. Aust Dent J 2011;56:181-92. Suneel VB, Kotian S, Jujare RH, Shetty AK, Nidhi S, Grover S, et al. Incidence of prosthetic complications associated with implant-borne prosthesis in a sleep disorder center. J Contemp Dent Pract 2017;18:821-5. Punjabi NM, Caffo BS, Goodwin JL, Gottlieb DJ, Newman AB, O'Connor GT, et al. Sleep-disordered breathing and mortality: A prospective cohort study. PLoS Med 2009;6:e1000132. Zupnik J, Kim SW, Ravens D, Karimbux N, Guze K. Factors associated with dental implant survival: A 4-year retrospective analysis. J Periodontol 2011;82:1390-5. Nedir R, Bischof M, Briaux JM, Beyer S, Szmukler-Moncler S, Bernard JP. A 7-year life table analysis from a prospective study on ITI implants with special emphasis on the use of short implants. Results from a private practice. Clin Oral Implants Res 2004;15:150-7.
van der Zaag J, Lobbezoo F, Wicks DJ, Visscher CM, Hamburger HL, Naeije M. Controlled assessment of the efficacy of occlusal stabilization splints on sleep bruxism. J Orofac Pain 2005;19:151-8. Glauser R, Rée A, Lundgren A, Gottlow J, Hämmerle CH, Schärer P. Immediate occlusal loading of Brånemark implants applied in various jawbone regions: A prospective, 1-year clinical study. Clin Implant Dent Relat Res 2001;3:204-13. Torcato LB, Zuim PRJ, Brandini DA, Falcón-Antenucci RM. Relation between bruxism and dental implants. RGO, Rev. Gaúch. Odontol. 2014;62:371-6. Tosun T, Karabuda C, Cuhadaroglu C. Evaluation of sleep bruxism by polysomnographic analysis in patients with dental implants. Int J Oral Maxillofac Implants 2003;18:286-92. Mendonça G, Mendonça DB, Fernandes-Neto AJ, Neves FD. Management of fractured dental implants: A case report. Implant Dent 2009;18:10-6. Misch CE. The effect of bruxism on treatment planning for dental implants. Dent Today 2002;21:76-81. Thymi M, Visscher CM, Yoshida-Kohno E, Crielaard W, Wismeijer D, Lobbezoo F. Associations between sleep bruxism and (peri-) implant complications: A prospective cohort study. BDJ Open 2017;3:17003. De Angelis F, Papi P, Mencio F, Rosella D, Di Carlo S, Pompa G, et al. Implant survival and success rates in patients with risk factors: Results from a long-term retrospective study with a 10 to 18 years follow-up. Eur Rev Med Pharmacol Sci 2017;21:433-7.